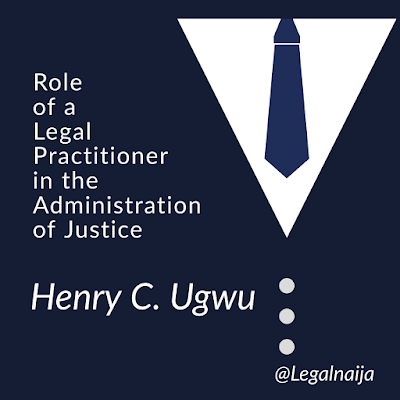 Home » » The role of a legal practitioner in the administration of justice: can a legal practitioner win or lose a case?|Henry Chibuike Ugwu. 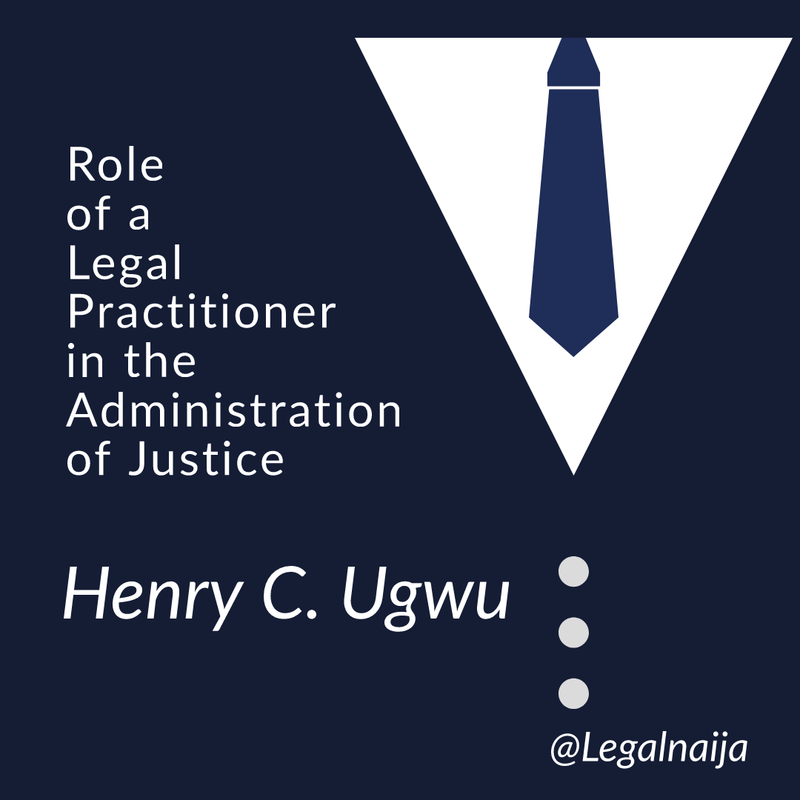 The role of a legal practitioner in the administration of justice: can a legal practitioner win or lose a case?|Henry Chibuike Ugwu. It has become rampant to see legal practitioners tout their perceived success rates with regards to cases they have handled in courts during press interviews, while discussing with prospective clients, on law office websites etc. Some lawyers would even say they have won a certain number of cases, lost others, and drawn a few; and at other times display graphical or pictorial representations of their success rates on law office websites and in other publications. This practice is even more disturbing because renowned and widely celebrated legal practitioners are also complicit. The result is that impressionable lawyers and especially the young wigs have been left with a notion of law practice that if not corrected may lead to a complete failure of the administration of justice in Nigeria. This notion encourages a defence lawyer to believe that it is only when his client is discharged and acquitted that he has won the case, or a prosecutor to equate conviction of a defendant to a successful rendition of his legal service. This notion has led many legal practitioners to do everything possible, including manufacturing evidence, encouraging perjury, and commission of crimes, in a bid to ensure they get judgments favourable to their clients. I need to reiterate the cardinal principle that counsel are ministers in the temple of justice and should therefore ensure that they stay on the side of justice at all times. It is the duty of counsel to present the case of his client to the best of his ability but the duty and loyalty of counsel does not extend beyond presenting the client’s case within the law and rule of professional ethics. Counsel owe a higher duty to the cause of justice. It therefore follows that a legal practitioner in rendering services to a client must ensure that he is within the bounds of the law at all times. A lawyer is therefore not permitted, during representation of a client, to aid or participate in any unlawful conduct, to give advice which he knows is capable of causing breach of the law, and to conceal any fact or evidence in proof thereof which he knows will aid the administration of justice, even if such fact or evidence does not support his case. [ii] See Obeten v. State (2007) ALL FWLR (Pt. 376) 711 and Co-operative and Commerce Bank (Nigeria) PLC. v. Okpala & Anor (1997) LPELR-6278 (CA). In a circumstance where a court of law convicts a defendant flowing from his plea of “guilty” during arraignment, and upon being satisfied that such a plea is consistent with the facts of the case, the lawyer who represented such a defendant cannot properly be said to have lost the case. In fact, a lawyer cannot win or lose a case. How could he when the case in the first place was never his? The Court of Appeal and Supreme have reiterated time and again that counsel qua advocate is an expert of the law and the facts of the case belong solely to his client. See Afribank Nigeria PLC v. Homelux Construction Company LTD & Anor (2008) LPELR-9020 (CA) and Alhaji Kachalla Musa v. AG Taraba State & Anor (2014) LPELR-24183 (CA). A legal practitioner has the responsibility, as master of law, to give legal advice to his clients and strictly apply the law to the facts of a client’s case. In circumstances where it is apparent to a lawyer that his client’s case is frivolous or that the chances of his client succeeding are extremely remote, he has a responsibility of informing the client of the uselessness of pursuing such a course in other to save his client from unnecessary expenses; and to save the time of the courts. See MAGIT v. University of Agriculture, Makurdi & Ors (2005) LPELR-1816 (SC); Jegede v. Afe & Anor (2017) LPELR-43232 (CA) and Okeke & Ors v. Okoli & Ors (1999) LPELR-6638 (CA). The practice by some lawyers in publicly portraying success rates on the basis of the favourability or otherwise of court judgments in respect of matters they handle for their clients is a breach of the rules and etiquettes regulating the conduct of legal practitioners in Nigeria. It cannot be overemphasized that the delicate nature of law practice is sober and a responsible lawyer must always contemplate the duties he owes to his clients, colleagues, the court and most importantly- the cause of justice, in all his professional dealings. A legal practitioner is always successful in the conduct of a client’s case when he devotedly and dedicatedly applies the law to the facts of his client’s case irrespective of the ruling or judgment of the court. Lawyers, and indeed law students must be reminded that a good lawyer should always be dispassionate about the facts of cases presented to him by clients. A lawyer is only permitted in the conduct of a case to be impassioned about the law and legal arguments he avails a court vis-à-vis the facts of his client’s case. Where this is case, the lawyer is always successful as his duties transcend the prosecution of a mere brief from a client but extends to aiding the hallowed courts effect God’s justice on earth. [i] (2018) LPELR-44686 (CA) Per Bolaji-Yusuff, J.C.A. (Pp. 32, paras. B). [ii] See generally Rule 15, RPC, 2007. [iv] Rule 37(3), RPC. See also Rules 37(4)-(6). [v] Rule 39(2)(c) & (d), RPC.